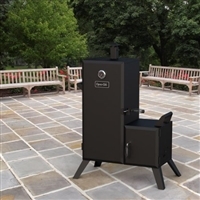 The main characteristics of the offset smoker are that the smoking (cooking)chamber is usually cylindrical in shape, with a shorter, smaller diameter cylinder (or square box) attached to the bottom of one end for a firebox. To cook the meat, a small fire is lit in the firebox, where airflow is tightly controlled. The heat and smoke from the fire are drawn through a connecting pipe or opening into the cooking chamber. Because the smoke flows over and around the meat, it flavors the meat with a smoke flavor, and therefore the low indirect heat cooks the meat before escaping through an exhaust vent at the opposite end of the cooking chamber. Even large capacity commercial units use this same basic design of a separate, smaller firebox and a larger cooking chamber. An offset smoker burns wood to produce heat and smoke. The sort of wood to burn varies on the selection of the pit-master. Several burn whole logs in their smoker, whereas others opt to burn wood chunks, ancient charcoal, charcoal chunks or perhaps wood pellets. The upright drum smoker is an upright steel drum that has been modified for the purpose of pseudo-indirect hot smoking. There are many ways to accomplish this, but the basics include the use of a complete steel drum, a basket to hold charcoal near the bottom, and cooking rack (or racks) near the top; all covered by a vented lid of some sort. They have been built using many different sizes of steel drums, but the most popular size is the common 55-gallon drum. 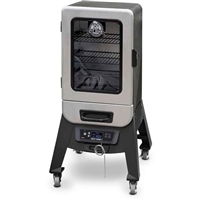 This design is similar to smoking with indirect heat due to the distance from the coals and the racks (typically 24 inches (61 cm)). The temperatures used for smoking are controlled by limiting the amount of air intake at the bottom of the drum and allowing a similar amount of exhaust out of vents in the lid. UDSs are very efficient with fuel consumption and flexible in their abilities to produce proper smoking conditions, with or without the use of a water pan or drip pan. Most UDS builders/users would say a water pan defeats the true pit BBQ nature of the UDS, as the drippings from the smoked meat should land on the coals, burning up, and imparting a unique flavor one cannot get with a water pan. 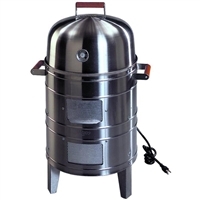 A vertical water smoker (also noted as a bullet smoker due to its shape) is a variation of the upright drum smoker. It uses charcoal or wood to generate smoke and heat and contains a water bowl between the fire and the cooking grates. The water bowl serves to maintain optimal smoking temperatures and additionally adds humidity to the smoke chamber. It additionally creates an effect in which the vapor and smoke condense together, which adds flavor to smoked foods. Additionally, the bowl catches any drippings from the meat that may cause a flare-up. 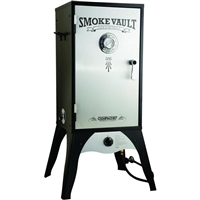 Vertical water smokers are very temperature stable and need little or no adjustment once the specified temperature has been reached. As a result of their comparatively low cost and stable temperature, they're typically employed in barbecue competitions wherever gas and electric smokers aren't allowed. 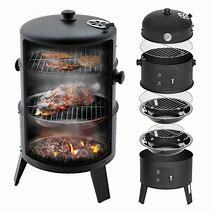 A propane smoker is meant to permit the smoking of meat during a somewhat more temperature controlled surroundings. the first variations are the sources of warmth and of the smoke. during a gas smoker, the warmth is generated by a gas jet directly beneath a steel or iron box containing the wood or charcoal that gives the smoke. The steel box has few vent holes, on the top of the box solely. By starving the heated wood of oxygen, it smokes rather than burning. Any combination of woods and charcoal could also be used. This technique uses much less wood, however, will need propane fuel. 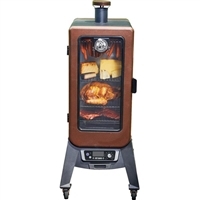 The most convenient of the varied kinds of smokers are the insulated electrical smokers. These devices house an element which will maintain temperatures starting from that needed for a cold smoke all the way up to 275 °F (135 °C) with very little to no intervention from the user. Though wood chunks, pellets, and even in some cases automatically-fed wood pucks are used to generate smoke, the quantity of flavor obtained is a smaller amount than traditional wood or charcoal smokers. In this technique the furnace is a slender trench cut down a slope pointing into the air current. The center part of the ditch is roofed over to form it into a tunnel. 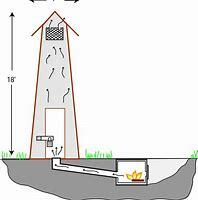 At the higher end of the ditch is a vertical framework covered to make a chimney inside that is placed the rack of foodstuff. At the lower upwind end of the ditch is lit a little smokey hearth, and sustained day and night till the foodstuff is cured. Commercial smokehouses, largely made up of stainless steel, have freelance systems for smoke generation and cooking. Smoke generators use friction, an electrical coil or a little flame to ignite wood on demand. Heat from steam coils or gas flames is balanced with steam or water sprays to regulate the temperature and humidity. Elaborate air handling systems scale back hot or cold spots, to cut back variation within the finished product. Racks on wheels or rails are accustomed hold the merchandise and facilitate movement. The pellet smoker is temperature controlled and burns wood pellets made of sawdust. The wood pellets are stored in a hopper that feeds a temperature regulated motor. This motor operates an auger which pushes the pellets into a heat box. An ignition rod lights the pellets and a combustion fan keeps them smoldering. These two items regulate the temperature of the smoker. A shield is above the heat box to keep the smoke chamber at an even temperature. There is a heat sensor inside the smoke chamber which controls the auger and fan to maintain the correct temperature for the cook.